Heraldic labels are used to differentiate the personal coats of arms of members of the royal family of the United Kingdom from that of the monarch and from each other. In the Gallo-British heraldic tradition, cadency marks have been available to "difference" the arms of a son from those of his father, and the arms of brothers from each other, and traditionally this was often done when it was considered important for each man to have a distinctive individual coat of arms and/or to differentiate the arms of the head of a house from junior members of the family. This was especially important in the case of arms of sovereignty: to use the undifferenced arms of a kingdom is to assert a claim to the throne. Therefore, in the English royal family, cadency marks were used from the time of Henry III, typically a label or bordure alluding to the arms of the bearer's mother or wife. After about 1340, when Edward III made a claim to the throne of France, a blue label did not contrast sufficiently with the blue field of the French quarter of the royal arms; accordingly most royal cadets used labels argent: that of the heir apparent was plain, and all others were charged. Bordures of various tinctures continued to be used into the 15th century. In the ordinary system of differences a label of three points (which has also been termed a label with three files) is the distinction of the eldest son during the lifetime of his father. In the oldest rolls of arms the labels are all of five points; but labels of three points were at an early period used interchangeably. Besides being used as mere temporary marks of cadency, labels are also employed as permanent distinctions, borne (like any other charge) by every member of some particular branches of certain families. Labels are the principal cadency marks used in certain royal families. In the British royal family, all labels are argent (white). The sons and daughters of the sovereign all bear labels of three points argent; that of the arms of the Prince of Wales is plain, but all others are charged. Further descendants of princes bear labels of five points charged. All such differences should be borne on the arms, crest, and supporters. A blue anchor, a symbol of hope, or of naval service, as borne by several Dukes of York. The Crown of England (sometimes called the Imperial or St Edward's Crown) borne by the abdicated king the Duke of Windsor, which is as unusual as the occurrence itself. Roses: the Tudor Rose (combined red and white) has been used as an English royal badge since 1485. Red hearts may allude to the arms of Lüneburg (part of the Hanoverian arms) or – for the descendants of Edward VII and Alexandra of Denmark – to the coat of arms of Denmark. The blue fleur-de-lis appears amongst the Royal Badges in England of the Stuarts. The thistle is an ancient badge of Scotland. The escallop shell was traditionally a token of pilgrimage on the Way of St James. The shell in the labels of The Duke of Cambridge and Prince Harry alludes to their mother's Spencer arms. The bee is a canting charge in the label of Princess Beatrice of York. The trefoil is a badge of Ireland, associated with St Patrick, who used it to illustrate the doctrine of the Trinity. British King from 1714. As George was never a cadet member of the British royal family, he never had such a label. (1683–1760) Prince of Wales 1714 Future King George II. (1705–1759) Princess Royal 1719 2nd child, eldest daughter of George II. Albert of Saxe-Coburg & Gotha (1819–1861) Prince Consort 1837 Husband of Queen Victoria. Quartered these arms with his paternal arms of Saxony. (1843–1878) 1858 Grand Duchess of Hesse. (1846–1923) 1858 Princess of Schleswig-Holstein. (1857–1944) 1858 Princess of Battenberg. (1864–1892) Duke of Clarence and Avondale 1890 The firstborn son of Edward Prince of Wales, died in 1892. (1884–1966) ? 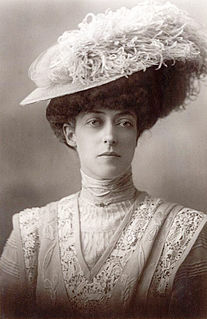 Duchess of Galliera. (1884–1954) 2nd Duke of Albany none Duke of Saxe-Coburg and Gotha. Deprived of his British titles 1919. Never granted arms in right of the United Kingdom, but used the arms of Dominion of Saxe-Coburg and Gotha as was his right as its sovereign. Duke of Windsor 1937 Unique use of a Crown for an abdicated monarch. and Strathearn 1942 Quarterly 1 and 4 his grandfather's arms; 2 Fife; 3 Duff. 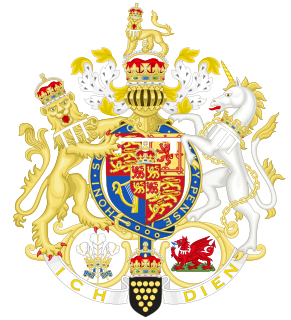 (born 1921) Duke of Edinburgh; Prince Consort 1947–49: his arms included an inescutcheon of his ancestor Princess Alice (Grand Duchess of Hesse): the Royal Arms with a label as shown above. (born 1982) Duke of Cambridge 2000 The escallop is taken from the arms of their mother Diana Spencer (1961–1997). (born 1988) 2006 Bee from the arms of her mother. The three bees are a canting of her first name. (born 1990) 2008 Thistles from the arms of her mother. ^ a b Ottfried Neubecker & John Brooke-Little: Heraldry: Sources, Symbols and Meaning (1997). ISBN 0-316-64141-3. "Signs of Differencing" (pp. 96–97). ^ François Velde: Marks of Cadency in the British Royal Family. Retrieved 7 December 2010. The title of Duke of Kent has been created several times in the peerages of Great Britain and the United Kingdom, most recently as a royal dukedom for the fourth son of King George V. Since 1942, the title has been held by Prince Edward, Queen Elizabeth II's cousin. Princess Victoria of the United Kingdom was the fourth child and second daughter of Edward VII and Alexandra of Denmark, and the younger sister of George V.
In heraldry, cadency is any systematic way to distinguish arms displayed by members of the nuclear family of the holder of a coat of arms, when those family members have not been granted arms in their own right. Cadency is necessary in heraldic systems in which a given design may be owned by only one person at any time, generally the head of the senior line of a particular family. As arms may be used by sons or wives 'by courtesy' whilst their father or husband is still living, some form of differencing may be required so as not to usurp those arms, known as the undifferenced or "plain coat". Historically arms were only heritable by males and therefore cadency marks have no relevance to daughters, except in the modern era in Canadian and Irish heraldry. These differences are formed by adding to the arms small and inconspicuous marks called brisures, similar to charges but smaller. They are placed on the fess-point, or in-chief in the case of the label. Brisures are generally exempt from the rule of tincture. One of the best examples of usage from the medieval period is shown on the seven Beauchamp cadets in the stained-glass windows of St Mary's Church, Warwick. In heraldry, an ordinary is a simple geometrical figure, bounded by straight lines and running from side to side or top to bottom of the shield. There are also some geometric charges known as subordinaries, which have been given lesser status by some heraldic writers, though most have been in use as long as the traditional ordinaries. Diminutives of ordinaries and some subordinaries are charges of the same shape, though thinner. Most of the ordinaries are theoretically said to occupy one-third of the shield; but this is rarely observed in practice, except when the ordinary is the only charge. Princess Beatrice of Saxe-Coburg and Gotha was a member of the British royal family, a male-line granddaughter of Queen Victoria. She later married into the Spanish royal family, and was the wife of Alfonso de Orleans y Borbón, Infante of Spain, a first cousin of Alfonso XIII of Spain. Prince William, Duke of Gloucester and Edinburgh, was a great-grandson of King George II and nephew and son-in-law of King George III of the United Kingdom. The Prince of Wales's feathers is the heraldic badge of the Prince of Wales. It consists of three white ostrich feathers emerging from a gold coronet. A ribbon below the coronet bears the motto Ich dien. As well as being used in royal heraldry, the badge is sometimes used to symbolise Wales, particularly in Welsh rugby union and Welsh regiments of the British Army. The most basic rule of heraldic design is the rule of tincture: metal should not be put on metal, nor colour on colour. This means that Or and argent may not be placed on each other; nor may any of the colours be placed on another colour. Heraldic furs as well as "proper" are exceptions to the rule of tincture. The blazon of the coat of arms of the Princess of Asturias is given by a Royal Decree 979 on 30 October 2015 which was an amendment of the Royal Decree 1511 dated Madrid 21 January 1977, which also created her guidon and her standard. In heraldry, a bordure is a band of contrasting tincture forming a border around the edge of a shield, traditionally one-sixth as wide as the shield itself. It is sometimes reckoned as an ordinary and sometimes as a subordinary. In heraldry, an ordinary componé, compony, gobony or anciently gobonne is composed of a row of panes of alternating tinctures, most often affecting the bordure.